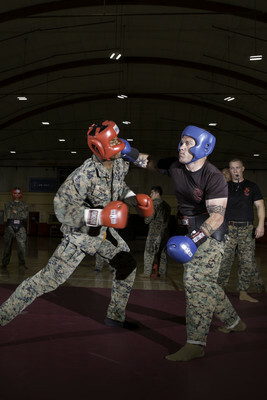 If you see several Marines fighting at various locations throughout the month of May, there is a good chance they are students participating in the Martial Arts Instructors Course aboard Marine Corps Logistics Base Barstow, Calif. The three-week course is taught by Gunnery Sgt. Justin Kratzer, radio maintenance chief in Communications and 3rd-degree martial arts instructor trainer. Included in his instruction staff are Staff Sgt. Justin Mears, Marine Corps Community Services chief and 1st-degree MAI trainer; Staff Sgt. John Fleming, logistics chief and 1st degree black belt instructor; Sgt. Regis Dugan, motor transportation mechanic and 1st-degree black belt instructor; Cpl. Kenneth Mullins, training noncommissioned officer and brown belt instructor. The variety of instructors allows for a broad array of capabilities and the training benefits the Marines in myriad ways. The students graduate with their current belt level, plus an additional tan tab, explained Kratzer. If the Marines have a gray belt status, they’ll also receive a boost in belt level upon graduation. The students are gaining much more than martial arts instruction through the program. The MAI course challenges Marines to push beyond their comfort zones in order to prepare to become not just experts in MCMAP, but to become excellent instructors and presenters, too. “I appreciate that they’re honing our leadership skills and teaching us how to give a period of instruction effectively,” said Staff Sgt. Keegan Borer, a quality control technician for Fleet Support Division and a student in the MAI course. Mears also pointed out the importance of acknowledging that, no matter how much you train or how hard you work, there’s always someone out there who is putting in more hours, working harder and doing more. The program is certified by the Martial Arts Center of Excellence out of Quantico, Va. It includes classroom lectures held at both McTureous Hall and the Major Gen. James L. Day Conference Center. The physical, fighting portions of the training are conducted at various locations throughout the base. The program includes informal and formal lectures, as well as physical demonstrations.